Stand up pouches from PBFY sport a convenient bottom gusset design that allows them to stand up on their own when full – except when they are flying off your shelves in the hands of eager buyers! Stand up pouches make ideal containers for a variety of solid, liquid and powered foods as well as non-food items. Food grade laminates help keep your eats fresher for longer, while the ample surface area makes a perfect billboard for your brand and can be used to display catchy logos and graphics. Look forward to major savings in freight, since stand up pouches take up minimal space in storage and on shelves. Worried about your carbon footprint? These environmental friendly pouches use up to 75% less material than the traditional bag-in-a-box, cartons or cans! PBFY offers you a wide range of stand up pouches for food packaging in clear and solid colors, glossy and matte finishes, and choice of materials. The one side clear and one side solid option combines the best of both worlds. Built-in oval or strip windows let your customers take a peek at your goodies! Choose from a variety of functional enhancements like reclosable zippers, degassing valves, tear notches and hang holes to suit your style. Order a free sample today! Stand Up Pouches are available for custom printing and custom labels. Visit our Custom Flexible Packaging page for more information about creating your own custom bag or contact us today and speak to a sales and customer service representative for a quote! What Kind of Stand Up Pouches Do you Need? Our 1oz. stand up pouches will get your customers’ attention. They are consumer-friendly, look great in stores and take up little space on shelves. Available in highly attractive colors, these pouches are ideal for almost any commercial use. Our bags will help your product stand out! Our affordable 16 oz. 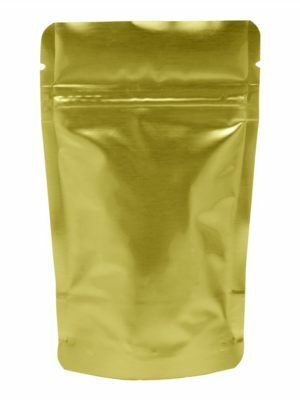 metallized pouches come in classic and neutral colors that will help to make your product stand out on any retail shelf. They have maximum impact while taking up minimum space. Customize them so that they represent your brand. In stylish white, these semi-transparent 16 oz Rice Paper Stand Up Pouches feature a display window to show your foods off perfectly, making them ideal for storing goods on shelves or at the register. These 16 oz. pouches have an easy-tear opening and are made from rice paper for a natural and contemporary style in your retail or cafe environment.